PennsylvAsia: Clones of D.C. cherry blossoms sent to Pittsburgh. 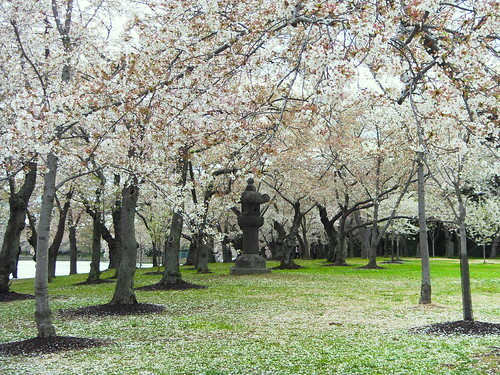 Clones of D.C. cherry blossoms sent to Pittsburgh. [Horticulturist Dave] Kidwell-Slak says the Arboretum has sent clippings of the gift trees to Pittsburgh and North Carolina for cities to plant. More recently, the arboretum and the park service sent 120 clones of the original trees back to Japan so scientists there can also retain the genetic line. Another set of trees has been sent to Pittsburgh to be planted in parks there. An email to Dr. Kidwell-Slak hasn't received a reply yet, so it's not known yet where the clippings were sent or under whose supervision they will be. I'm pulling for Schenley Park.